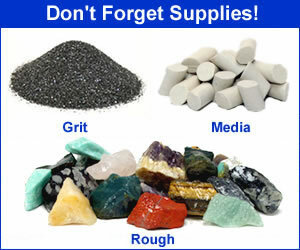 We sell replacement motors, bearings, guides, shafts, retainer clips, barrels, retainer rings and lids. To purchase a complete machine or get more information, visit our Model B tumbler page. This Thumler's Model B belt can be changed out without the use of any tools. Remove the old one and slip on the new one. It is that easy. This belt also fits all Thumler's A-R model tumblers. Thumler's Model B bearings are made of durable polyethylene. Bearings are simple to replace. Remove the retainer ring, slide the old bearing off, put the new one on and replace the retaining ring. We suggest purchasing some extra retainer rings just in case you damage some while taking it off or putting it on. Thumler's Model B barrel guides are made of polyethylene. The guides are easy to replace. Remove the retainer clip, remove the bearing, rubber roller and then the old guide, slide a new guide on and put the other parts back on the shaft. We suggest purchasing some extra retainer clips just in case you damage one. 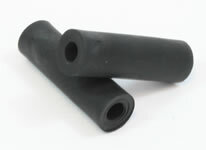 These rubber rollers are on both the drive shaft and idler shaft of a Thumler's Model B tumbler. 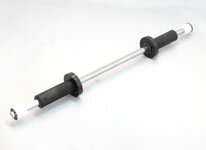 This differs from all other Thumler's tumblers which have nylon rollers on their idler shafts. Thumlers Model B replacement drive shaft that is easy to replace. Remove the belt, lift out the old shaft, snap in the new shaft and put the belt back on and you're ready to tumbler. It is a complete shaft with all components already on it. A complete idler shaft for the Thumlers Model B rotary tumbler. Simple to replace, pop out the old shaft and put the new one in. 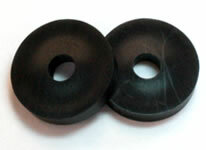 Includes: Nylon rollers, bearings, Shaft, barrel guides and retainer rings. This is the metal lid for Thumler's Model-B fifteen-pound barrel. 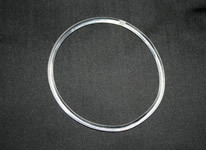 This rubber gasket is what gives the 15-pound barrel on a Thumler's Model B tumbler a watertight seal. If you are trying to use this for a different tumbler barrel be sure to take accurate measurements. It usually does not fit other types of tumblers. Hole center to hole center = 8"
Replacement rubber barrel liner and gasket that gives the Model B barrel its watertight seal and quiet tumbling action. A set of 6 wing nuts to tighten the lid on Thumler's fifteen-pound Model B barrel. 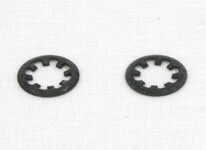 A set of 6 washers for under the wing nuts on Thumler's fifteen-pound Model B barrel. Thumler's Model B rock tumbler barrel is a large hexagon barrel with a 15-pound capacity. It is a metal and rubber barrel that comes with all the parts included so you can start tumbling as soon as you receive the barrel in the mail. Outside height includes washer and wing nut. This pulley fits Thumler's Model B tumbler motor. 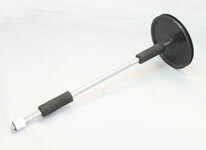 The Model B pulley has a 5/16" bore diameter and 3/4" outside diameter. This is a the metal base for Thumler's model B rotary rock tumbler. This is sold as the base only, no motor, shafts, or belt come with the base.